There’s no flora on the Mün, but there are tech trees. Kerbal Space Program – which is super good according to Steve’s Kerbal Space Program review – now has a partly-featured career mode to complement its sandbox space meanderings thanks to today’s 0.22 update. Career mode is still “very much” under active development, but players can already begin Career saves in their Steam Early Access version of the game. The new Research & Development Facility at the Space Center allows players to research tech tree nodes in order to unlock parts and, later, “stuff”. To research, you’ll first need Science, which the artists among you will be enlightened to discover is a quality acquired by performing experiments during missions. “Collect surface samples while on EVA,” explain developers Quad, “and process them to do Science”. Science experiments return results, which vary according to the situation in which they are performed. Squad recommend that you repeat them in many different situations across the whole solar system to expand your tech tree and therefore your potential collection of parts. Newly functional parts include antennae and scientific sensors, which now transmit Science data back to Kerbin if experiments are impossible to physically recover, as well as a Communotron 88-88 Comms Dish that doesn’t break ships and nose cones that actually improve stability during atmospheric flight. Plenty more have had their values tweaked ahead of them “actually meaning something in the near future”. “This update was one of, if not the largest update we’ve ever done in terms of amount of content and features,” say developers Squad. Added a system to allow saving and loading of Sub-Assemblies. Subassemblies are subsets of spacecraft, which can later be attached to other designs and re-used. Greatly improved the Island Airfield. Added a new backdrop and soundtrack for the Astronaut Complex Facility. Added a new music track for the R&D Facility. It is now possible to recover a flight after landing/splashdown on Kerbin without going through the Tracking Station. Look above the Altimeter. The SAS system was again largely overhauled, based on all the feedback we’ve gotten from everyone. It’s now stabler than ever. Celestial Bodies now support Biome Maps, which are used to create different conditions for experiments. Biomes are currently implemented on Kerbin and on the Mun, more will be added on later updates. We’ve got a new launcher application for KSP, featuring a news bulletin, patcher management, and also allows you to tweak settings from outside the game. 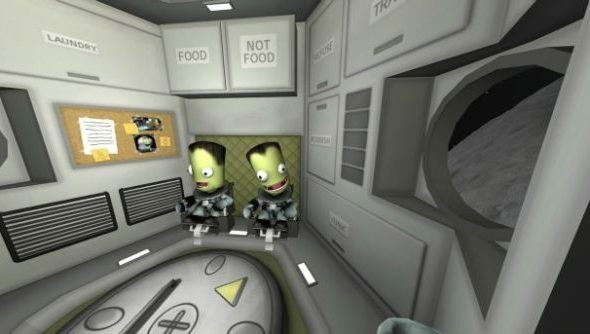 Steve encapsulated the appeal of the game like a Kerbal in a capsule in our Kerbal Space Program alpha review. Now tacked to a tangible progression system, it’s one of the most exciting new PC games you could buy into. Do you think you will?